A delicious moment of reality. Consultant, reporter, author and former NASA employee Jame Oberg nails British TV news on their snide claim that astronauts flew aboard the Shuttle drunk. They didn't. The issue involved a Suyuz launch and a T-38 flight, not the Shuttle, as reported. But worse, Jim points out, the press missed the bigger story - astronauts apparently are not subject to the same medical screening as civil servants at NASA nor, for that matter, private pilots. Here's a thought provoking analogy written by Judith Jarvis Thomson from Philosophy & Public Affairs, Vol. 1, no. 1 (Fall 1971). Ever wonder how things work inside. Well, okay, I suppose you need to go get an advanced degree in physiology or medicine if you really want to understand how they work. But if you've ever just wondered what things really look like in there, take a look at this CT scan image. If you have to get a CT scan or MRI yourself, ask for a copy of the scans on CD. They should be willing to provide it without cost (or hastle). Now pop the CD into your Mac running OS 10.4 and go get a free open source copy of OSIRIX. Instead of a little image like the one here, you'll see it full screen, with all kinds of cool tools to change the density, color, angles, etc. Ta-dah, all you'd ever want to see of your own insides--and then some. Female mosquitoes, the only kind that will infect you, have to at eat least every 3 days. When they do, they ingest the human equivalent of a bathtub full of blood (2.5x body weight). In the process they accidentally inject parasites along with anti-coagulant spit. All manner of animals, not just humans, get malaria from rats and bats to chimps and humans. In other words, malaria parasites aren't very particular where they live, so you'll find them almost everywhere. 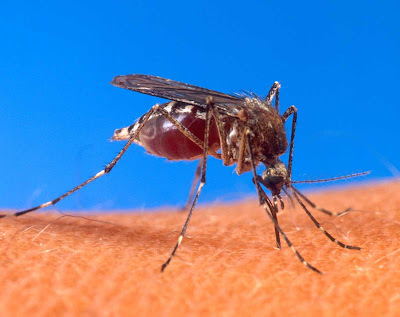 A typical mosquito carries 100,000 malaria parasites in its glands. 50,000 of the parasites could live in a space the size of the period at the end of this sentence, but it only takes one to kill you.